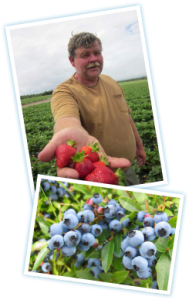 Millen Farms is a family-owned sustainable berry farm nestled in the heart of Nova Scotia’s famed blueberry lands. The Millen family farm, owned by Curtis and Ann Millen, almost 40 years ago in the Great Village area. The operation, which involves the whole family, includes 150+ acres in strawberry and 600+ acres of wild native low bush blueberry. The farm is noted for its strawberries and wild blueberries. The strawberries are picked fresh each day, morning and evening. Most often they are delivered to the buyer straight from the field for freshness to the consumer. Most of the wild blueberries are hand raked by about 175 hand rakers. The Millen’s firmly believe that hand harvesting their blueberries is the key to a better berry for consumers – less processing means blueberries that are closer to what you’ll find at harvest time. You can find the hand raked blueberries in the 5lb box or 1kg tub. Machine harvested blueberries can be found in the 1.5Kg and 600g bags. CanadaGAP® is a food safety program for companies that produce, handle and broker fruits and vegetables. The program has received full Canadian Government Recognition, and is designed to help implement and maintain effective food safety procedures within fresh produce operations. The program is benchmarked to and officially recognized by the Global Food Safety Initiative (GFSI). Audit and certification services for the program are delivered by accredited Certification Bodies.